High performance windsurfing rentals are available at our 207 Front St location seven days a week from 9:00am-5:30pm. Please call us at 888-509-4210 or 541-386-6086 to book now! Beginner and intermediate windsurfing rentals are wrapped up for the 2018 season. The Hook center will resume rentals mid-May of 2019. Be sure to check out the used windsurf boards and used sails sections for great deals on our rental equipment. 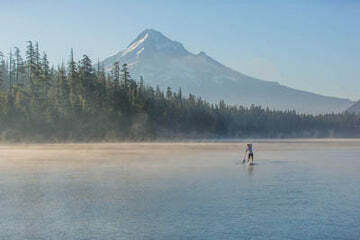 Located in Hood River, Oregon, in the Columbia River Gorge, Big Winds offers the largest selection of new boards and sails in the area. Our goal is to get you on gear you're excited to ride. We encourage gear swaps, and if you choose to buy a board from us, we’ll apply two days of your rental fee towards your purchase! Our windsurf package includes a board, three sails and a mast, along with every accessory you’ll need to hit the water. We even have rack pads and straps for your car. Includes one board, three sails, mast, boom, base, extension, board bag, rack pads and rack straps. Includes one windsurf board with base, board bag, rack pads and rack straps. Includes three sails with mast, boom, base and extension. Includes one sail without rig components. Includes either a boom or a mast. Includes one wetsuit and a pair of wetsuit booties.